All users of the Advanced Microscopy and Imaging Center are encouraged to participate in the Image of the Month contest. To participate, simply email an image that you took with one of the Center instruments to microscopy@utk.edu with a short description of what the sample is and how you have imaged it. Only two-dimensional images will be accepted (no 3D image stacks or time-lapse sequences). At the beginning of every month, a panel of experienced microscopists will select the best image and post it on this page. 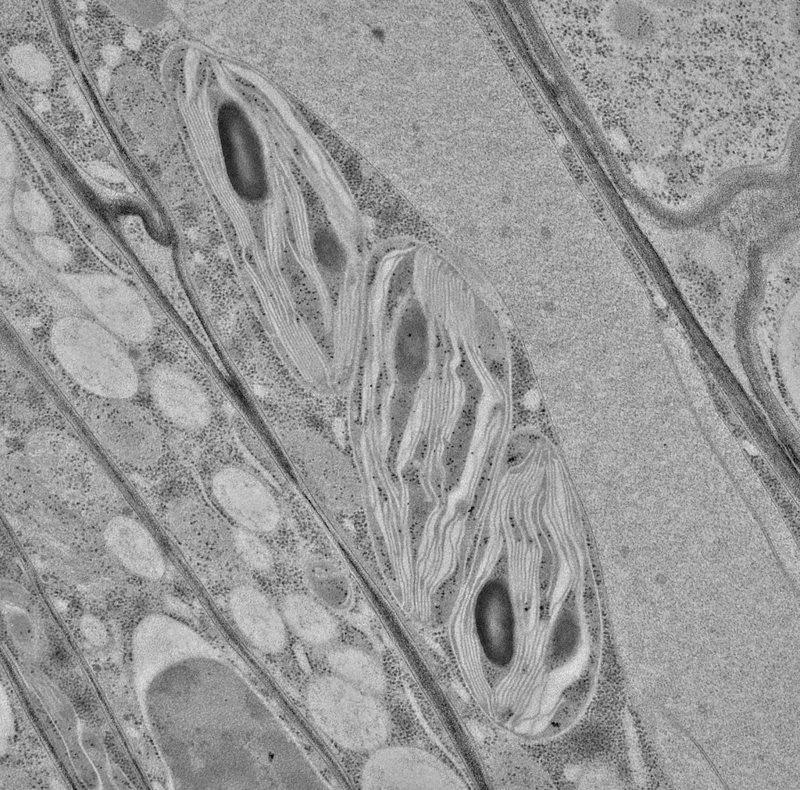 Chloroplasts from a Nicotiana benthamiana leaf imaged with the new JEOL JEM1400 transmission electron microscope. The sample was prepared for TEM via high pressure freezing and quick freeze substitution. Uranyl acetate and osmium tetroxide were used for fixation and staining. High quality fixation is evident by smooth membranes and lack of other EM artifacts. The high level of ultrastructural preservation allows for visualization of many chloroplast structural features including thylakoid membranes, grana, and even chloroplast ribosomes. The JEOL JEM1400 electron microscope is the newest addition to the Advanced Microscopy and Imaging Center. It has a high-contrast objective and operates at up to 120 kV, two features that are ideal for biological and soft-material samples. A special high-tilt holder can turn the sample in the electron beam for the reconstruction of electron tomograms that allow ultra-high resolution 3D images in the nanometer range. Brandon Reagan is a graduate student in the lab of Dr. Tessa Burch-Smith in the Department of Biochemistry & Cellular and Molecular Biology.